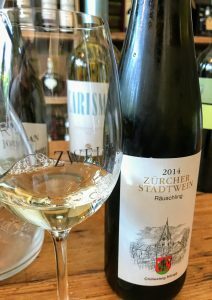 Some quick thoughts on the 2011 Winzer Krems Blauer Zweigelt St. Severin. Winzer Krems is a co-operative based in the Kremstal region of Austria. Founded in 1938, today the co-op includes 962 growers farming over 2400 acres of grapes. According to Jancis Robinson’s Wine Grapes, Blauer Zweigelt is a 1922 crossing of Blaufränkisch and Saint Laurent. Through its parent Blaufränkisch, Blauer Zweigelt is a grandchild of Pinot and Gouais blanc and niece/nephew of Auxerrois. 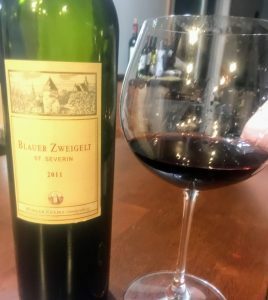 Covering more than 16,000 acres in Austria, Zweigelt can be found in limited plantings in Germany, United Kingdom, Hungary, Czech Republic, Slovakia and Canada. 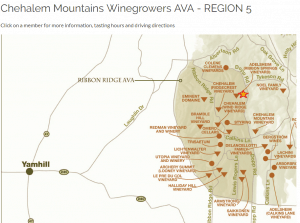 In the United States, there are a few producers in Ohio, Pennsylvania and the Snake River Valley AVA of Idaho experimenting with the variety. It has also been a beneficiary of global warming with increased plantings in the northern Japanese island of Hokkaido that is considered a wine region to watch out for in 2018. This bottling of Winzer Krems’ Zweigelt is dedicated to St. Severinus of Noricum, the Austrian saint who, according to legend, lived and worked in the vineyards of Krems during the later years of his life. Medium intensity nose. Fresh and fruity like red cherries and blueberries. There is a little green note like tomato leaf around the edges. 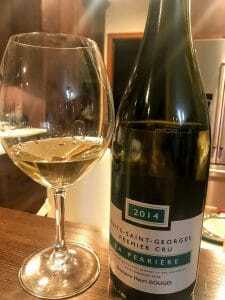 On the palate is medium-plus acidity that adds juiciness and freshness to the fruit. A little bit of spice pops up to add some interest. Pair this wine with something on the grill. At around $12-15, this is a fun BBQ wine. 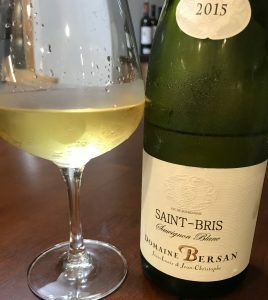 Medium body with moderate alcohol, the recurring theme is freshness which makes its an easy wine to kick back and drink without wearing down the palate. A good bet for someone who wants something a little bit bigger than Pinot noir but not quite as jammy or spicy as what a Malbec can get. 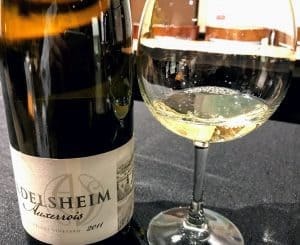 Tagged Austrian wine, Auxerrois, BBQ wine, Blauer Zweigelt, Blaufränkisch, co-op, Gouais blanc, Hokkaido, Jancis Robinson, Japanese wine, Kremstal, Malbec, Pinot noir, Saint Laurent, Snake River Valley AVA, Wine Grapes, Winzer Krems, Zweigelt.